What does does text mean? What sort of problems can you solve. This was a very neat overview of the topic and gave persuasive arguments around the idea of using a data frame for manipulating text. 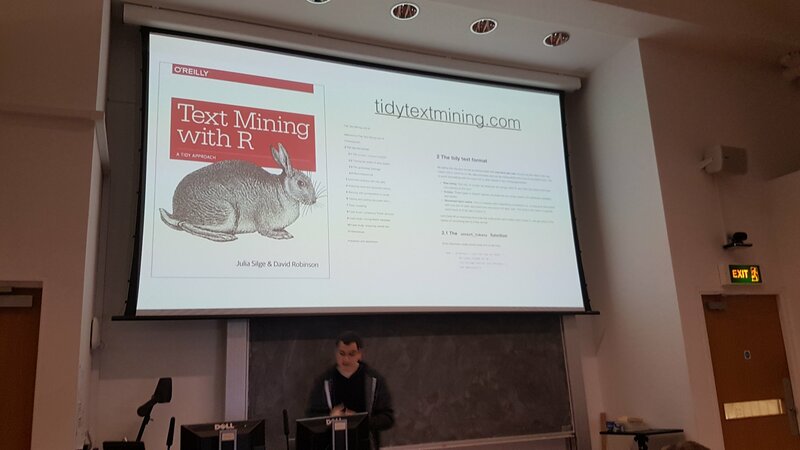 Most of the details are in Julie’s and his book on Text Mining with R.
Personally, I found the second part of his talk the most interesting, where Dave did an “off the cuff” demonstration of a tidy text analysis of the “Scottish play” (see Blackadder for details on the “Scottish play”). anti_join() – remove any stop_words. The str_detect() uses a simple regular expression to determine if the text are capital letters (theyby indicating a scene). Any expression of length zero is replaced, by a missing value NA. Before finishing with the zoo na.locf() function to carry the last observation forward, thereby filling the blanks. In my opinion, the best part of the night was the lively question and answer session. The questions were on numerous topics (I didn’t write them down sorry! ), that Dave handled with ease, usually with another off-the-cuff demo.